Though economically advanced in the Middle Ages, the Middle East was exhibiting clear signs of economic backwardness by 1700. The reason for this transformation is that key components of the region’s legal infrastructure stagnated as Western Europe experienced economic modernization. Among the institutions that generated evolutionary bottlenecks are the Islamic law of inheritance, which inhibited capital accumulation; the absence in Islamic law of the concept of a corporation, which hindered the exploitation of advanced technologies; and the waqf (vakıf), which, for all its advantages, locked vast resources into unproductive organizations for delivering social services. These obstacles to economic development were largely overcome through radical reforms initiated in the nineteenth century. Nevertheless, traditional Islamic law remains a factor in the Middle East’s ongoing economic disappointments. The lasting consequences of traditional Islamic law include the weakness of the region’s private economic sectors and its human capital deficiency. 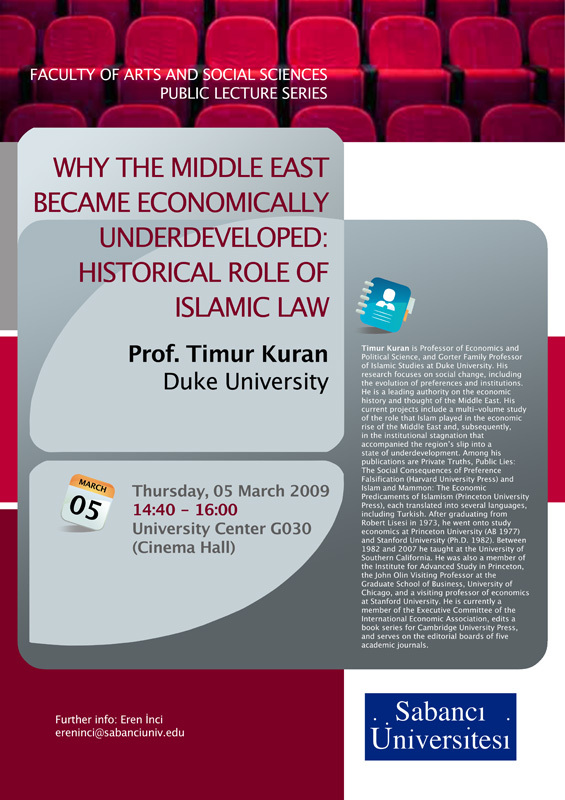 Timur Kuran is Professor of Economics and Political Science, and Gorter Family Professor of Islamic Studies at Duke University. His research focuses on social change, including the evolution of preferences and institutions. He is a leading authority on the economic history and thought of the Middle East. His current projects include a multi-volume study of the role that Islam played in the economic rise of the Middle East and, subsequently, in the institutional stagnation that accompanied the region’s slip into a state of underdevelopment. Among his publications are Private Truths, Public Lies: The Social Consequences of Preference Falsification (Harvard University Press) and Islam and Mammon: The Economic Predicaments of Islamism (Princeton University Press), each translated into several languages, including Turkish. After graduating from Robert Lisesi in 1973, he went onto study economics at Princeton University (AB 1977) and Stanford University (Ph.D. 1982). Between 1982 and 2007 he taught at the University of Southern California. He was also a member of the Institute for Advanced Study in Princeton, the John Olin Visiting Professor at the Graduate School of Business, University of Chicago, and a visiting professor of economics at Stanford University. He is currently a member of the Executive Committee of the International Economic Association, edits a book series for Cambridge University Press, and serves on the editorial boards of five academic journals.